I want to tell you why my mission is so important that I am opening up and being all vulnerable by letting you read my diary. To spread great ideas on how to accept, appreciate and really love yourself, because I know that being confident is the key to being happier, more successful and having a fulfilling and meaningful life. I went through some challenging times when I was searching for my forever home, my place in the world. I did not understand some of the things other people did, and why they would behave in a way that wasn’t nice, so I got confused, and that didn’t feel good at all. When lots of things came at me at once, I retreated to a very dark place. Luckily, I had my “framily” to help me out and allow me to see that I am a wonderful and radiant being of light and I can and have done many awesome things already. Once I learned to love and appreciate myself, and how to stay in a positive frame of mind no matter what others may say or do, life got really good. I am so much happier and it seems like everything always goes my way. I am able to manifest such incredible things because I have learned how to keep my energy vibrating at a very high frequency, which makes me a success magnet. I have shared my journey and my heart with you in my diary, and with an open heart, I invite you to delight yourself with my story and learn how to deal with difficult people, conflict and inner doubts, just like I did. I want you to be as happy as I am. I promise you will love the story and learn so much. Once you read the story, please pass it on and be part of my mission. It is so important for parents to really feel self-love and live a life of confidence. Why? ~ You deserve a fantastic life that is easy, fun and fulfilling! ~ Children learn from how their parents act, not what they say. How can you teach confidence or convince your children they have value when you don’t value yourself or your abilities? ~ The best way to protect our children is to teach them to protect themselves, emotionally. This book provides the tools for them to do so, hidden in an adorable story they will love. ~ Parents say my diary format allows them to read with their children and gives them an opening to discuss relevant issues that can be challenging to bring up. This book is so fun. You will love it. We will get to be good friends as I open my heart to you. In return for your time, I will make sure you learn about how to deal with some of the crazy stuff we have to deal with in life. There are ways to make life much more fun. I want to make sure you understand how awesome you are so you can love this life you have been blessed with and bless the world by sharing your unique talents. You may wonder what this book has to do with being a mega success. EVERYTHING! I want you to be so happy and vibrating at such a high frequency, that you become a manifesting magnet. That’s the secret behind the secret. ~ While keeping a highly positive state of mind so you can vibrate at the same frequency as the awesome life you deserve. I want you to have a wildly abundant and prosperous life! Get your copy now. And please help me further my mission to help others really love themselves and confidently live the life they desire and deserve. My worst nightmare came true. I don’t even know where to begin. It was all his fault. He ruined me and I will never be the same. I am tainted and torn, and I will never be loved again. I am not worthy of love. I know you think I am being melodramatic, but it is the truth. Here’s what happened Diary! First thing this morning, we were taken out of our boxes and placed on hangers. Next, they attached little pieces of paper to us with our stock number (or SKU) and our price. Each item in this big store has its own SKU number. But I am getting off track; I don’t really want to think about what happened to me or what will surely be my resulting fate. We were in the middle of the women’s clothes area. 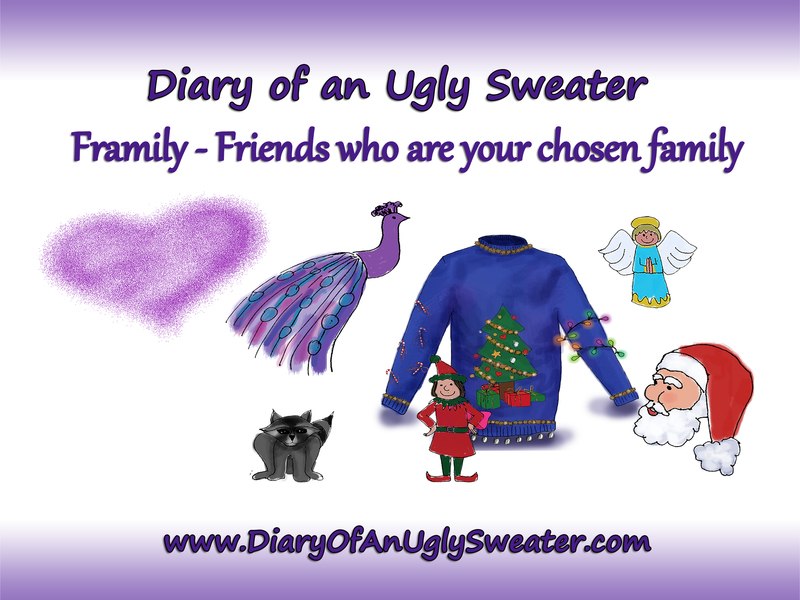 There were other sweaters, shirts, jackets, pants, pajamas – thousands of beautiful choices all in one place. Across the aisle were purses and scarfs, and behind them was sparkling jewelry hanging from displays, while other items were being shown inside glass cubes. The jewelry really held my attention. All that sparkle and bling! That’s why I wasn’t paying attention when he walked up behind me. This large, short boy with red freckles all over his face grabbed me off the rack and held me up above his head. “Check this one out,” he bellowed. I didn’t get a good vibe from him at all. I was clearly several sizes too small for him. He brought me over to a girl who was more my size and he started pulling on my poms … hard! “Look at these,” he said as he chuckled in a weird, unpleasant way. Then he started pulling my poms even harder and asked her if she liked them. Then it happened. He pulled one of my poms right off me! The pain was unbearable and I almost blacked out. Through the pain where my pom had been viciously ripped from me, I could feel a deeper pain. What did she mean nobody would want me? I was still the same. It wasn’t my fault I had been injured. My pom could be reattached! three girls were calling me ugly and taking pictures of each other while wearing me. The combination of being scared, humiliated and hurt was making me a little sick to my stomach. Adding further insult to injury, the buffoon tossed my pom on the floor and stuck me between the other sweaters on the rack. I was not put back on a hanger; I was not folded nicely. I was just hidden so he wouldn’t get in trouble for being mean to me. My only solace was in knowing that I wouldn’t be stuck going home with him due to the store’s “you-break-it-you-buy-it” policy. Nobody saw him “break” me. I looked over at the jewelry, but it didn’t seem to sparkle as bright as it had only a scant few moments before. I felt so cheapened by the abuse of that boy that I couldn’t enjoy the kids, or the laughter, or the spirit of Christmas; that is, until just before closing. What I saw and heard then changed everything. I saw a young woman pushing her child in a small pink wheelchair. The young girl looked to be about six years old in people years. She had dark beautiful hair and bright green eyes, along with the cutest pink cheeks. The mother was clearly looking for Christmas deals, as she turned every price tag before taking any item off the rack for a better look. An elderly man with a cane came hobbling along. He was in a hurry and not paying attention to what was going on around him. As he hurried past the mother and daughter, his cane ran into the little girl’s leg and she let out a muffled cry. This startled the old man, and once the look of surprise cleared his face it was replaced by hostility. “Excuse us, sir. We will be more mindful in the future,” was the woman’s gentle reply. Not quite satisfied but left with nothing to say, the old man retreated, cane in hand and grumbling under his breath. Once he was far enough away, the little girl looked up at her mother, confused and wanting answers. I wanted to reach out and tell her that it was not her fault, that she had no reason to feel bad. And as this urge got stronger, I realized that this was good advice for me, too. It wasn’t my fault that a boy had been mean to me earlier, either. The only difference was that I had to worry about never being picked by a forever person and the little girl had a mom. But I know I’ll never forget what the little girl’s mother told her in response to the very valid questions. The woman squatted down so she was eye level with her chair-ridden daughter. “When did you start feeling bad inside?” her mom queried. “And the lesson here, my precious Elizabeth, is this: You cannot change what other people will say or do. But realize that when someone is being mean or belittling you, it is all about what they are going through – which has nothing to do with you. When you reach out in compassion, even when you are not being treated with the same respect, you will always know you did your best. And when you keep your thoughts on feelings like love and compassion, you have a superpower. It’s like an invisible force field blocking any negative energy from putting you in a bad mood. “I understand, mommy,” said Elizabeth as she leaned forward and threw her arms around her mother’s neck. As her mother stood back up and start wheeling Elizabeth away, I found myself smiling, too. This was exactly what I needed to hear; exactly when I needed to hear it. I was going to be compassionate about the mean boy who pulled off my pom. Maybe his mother dropped him on his head when he was a baby; or maybe he drank cleaning fluid as a kid. But I now knew that I was still wonderful, and the right person would see that. I would find a forever home no matter what the brain-damaged person had done to me. I also realize that perhaps I still need to work on this compassion thing, but it’s a start.